This is one of my favourite reflection photos, but it is in colour, as it should be, so I can't enter it into Daveks' photo contest. I usually make the decision on colour or B&W before I take a photo, and I rarely change my mind. Some subjects aren't as suited for B&W as others and I think they shouldn't be forced into it just because you can 8-). 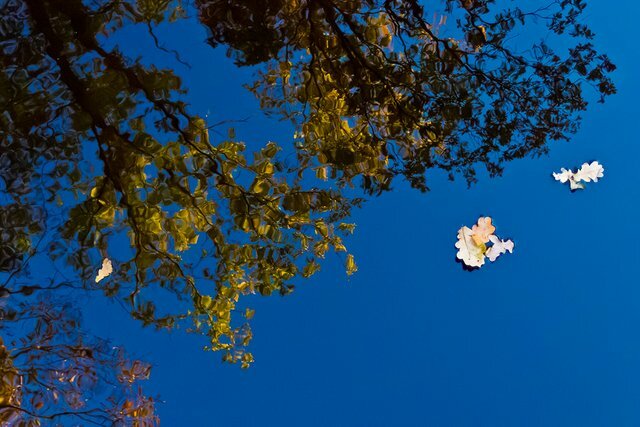 Apart from the slight distortions of the reflection of the tree, it doesn't look like water ~ So the leaves appear to be alternating between floating on water and then on air ~ For me anyway, and I love images that play with your mind like that @ocrdu. So do I; a few seconds of confusion is nice 8-). This shade of blue is very appealing. I really like this frame. Thank you for showing this option. great photos Resteem me and I will do Resteem your post ! I had to look at it twice or three times to actually see it. A sky like that deserves to stay blue. I'm looking again and it still has an optical illusion fully intact. Good to hear it works 8-). This post has been ranked within the top 50 most undervalued posts in the first half of Aug 12. We estimate that this post is undervalued by $15.31 as compared to a scenario in which every voter had an equal say.